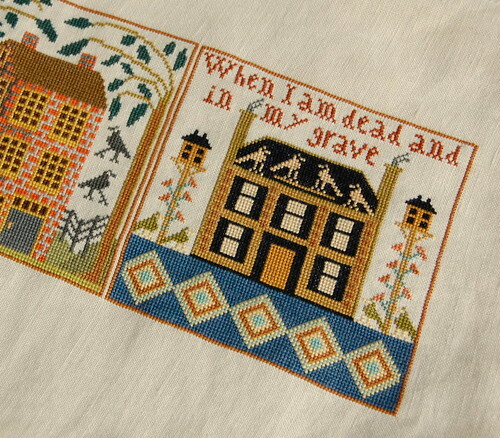 I decided to work on "With My Needle" yesterday during the day and then I worked on HoHRH at night. I stitched as late as possible and then finished up block three today. I was determined to get that block finished before the end of March. I had to catch up with Margie too! :) She's using NPI Silk - it's amazing how different our blocks look! Well, the kids are off school today, so we are just hanging out and relaxing! We may go to the grocery store later - so exciting! :) I'm trying to decide what I want to stitch tonight - maybe my nephew's sampler? I really should get back to it! Write later! Edited to add... I almost forgot! I also worked on "This is the Day" the other night. I finished the numbers and started filling in the white around them. WMN is looking great. I love that gold color.... Yes the baby's sampler ...I am really looking forward to more progress pictures. This design is so sweet. Wow, great progress on both. The colors are so rich...I just love them! And your houses are looking DIVINE! I just can'believe how much you get stitched. I am still trying to finish up block 5 of SOHRH and already you have another block done plus even more. Both of these are beautiful and I love them! Your stitching is gorgeous! Congratulations on finishing your third block, Nicole - it's beautiful - I love the pattern at the bottom. You're making great progress on your other pieces, too! Congrats on finishing the third block! All of your projects are coming along beautifully! WMN is looking great! 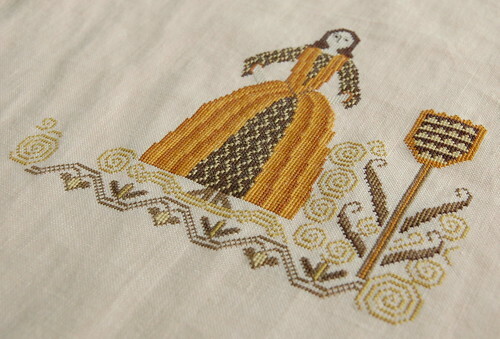 You are one amazing stitcher; I can't believe how fast you are ! You crack me up! :-) Both look great. 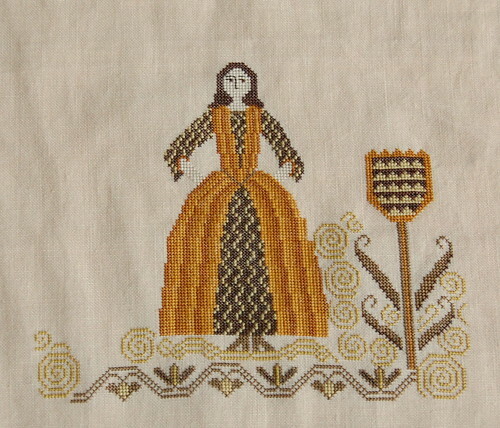 I'm tracking down the Goode Huswife book, I LOVE that sampler. First of all, love the color of your QC. What count fabby is that? 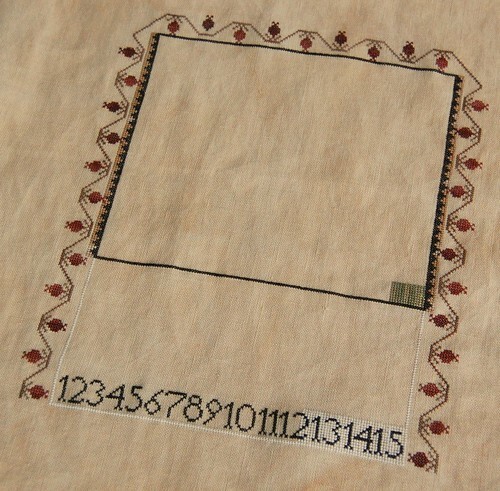 Your stitching always looks great and the designs are always fabulous. I am going to start VOHRH and am wondering if I should go with NPI silks. I have to go check out margie's blog. Your photo's alway show fantastic color. Wow. You rock! I love your WMN... I haven't been all that pushed on this until I've seen your WIP pics and now think I'm going to cave and stitch it. Love your HoHRH! I can't believe how much progress you've made on your, erm, TitD, too! ;) You're going to have several sampler walls before you know it! Such a busy little bee you are Nicole, hopping from WIP to WIP. :) All your projects are looking so gorgeous! Enjoy your weekend!! Beautiful progress on all ! Oh my, they all look terrific, Nicole! Congrats on completing that square. And I adore your With My Needle, I am going to have to acquire that chart! Beautiful Progress on all of your Projects...they are all so very pretty too. Beautiful progress. Wow, there is a huge difference in colours between your HoHRH and Margie's. I think the DMC threads are just so much more vibrant and the silks have that antique kind of look. Great wips Nicole, your needle has been busy this week. Gorgeous! I love the colors you are using on This is the Day! The HoHRH and WMN are both pretty, too. Wonderful progress on your WIP's! They are looking just amazing! Your WIPs look terrific. You have been stitching up a storm on them. I also stitch my Houses with DMC and have often noticed how different it looks than the ones stitched with NPI silks or with HDF silks. It's always amazing to me how much the choice of threads can change the impression of a piece. Nicole, I just love your photos. There is a quality to them that is just brilliant. Your Houses is really inspiring me to seriously get going on mine. So I thank you for that! All of your work is just drop-dead gorgeous!